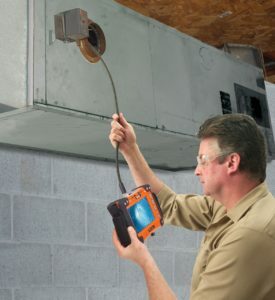 The new Gen-Eye X-POD® pipe inspection camera features a powerful new Command Module with USB port to record video inspections on flash drives. It’s packed with features like a big 7” LCD color monitor for crisp, clear pictures, one-touch recording, digital zoom, voice-over recording, date and time stamp, and flash drive capacity indicator. Adjustable mount lets you set the monitor for the best viewing angle. The Command Module also includes a 3 ft. Probe Rod with color camera for inspecting hard to reach places. Three adapters are included to improve your viewing angle or to retrieve objects. Just grab it and go! 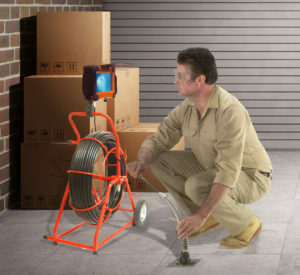 The full size X-POD features a self-leveling color camera and 200 ft. Gel-Rod® for inspecting 3” to 10” drain lines. 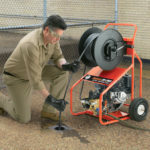 The compact Mini-Reels carry 100 ft. or 200 ft. of Gel-Rod® with mini self-leveling camera for trouble shooting 2” and 3” lines. The rugged steel frames and reels include a drag brake and reel lock. 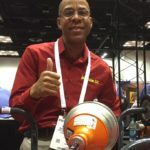 Full size reels sport 10” wheels to more easily roll the camera to and from the job. 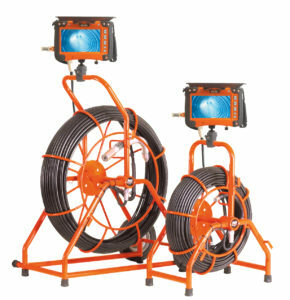 The full size reels feature a self-leveling color camera and 200 ft. Gel-Rod® for inspecting 3” to 10” drain lines. Ten inch wheels ensure easy transport to and from the job. The compact Mini-Reels carry 100 ft. or 200 ft. of Gel-Rod® with mini color self-leveling camera for trouble shooting 2” and 3” lines. The tough steel frame can be operated vertically or horizontally, so you can handle nearly any application. 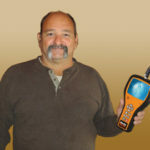 Large 7” LCD color monitor gives you crisp, clear images to make it easier to see the picture while doing inspections. USB Port Record video or still images on flash drive. Can handle up to 128 GB flash drive. Includes GX-500 Command Module, SL-GL-200 reel with Self-Leveling Color Camera, Docking Kit and 2, 3,& 6″ skids. Includes GX-500 Command Module, SL-M-GL-100 reel with Mini Self-Leveling Color Camera, Docking Kit and 2 & 3″ skids. 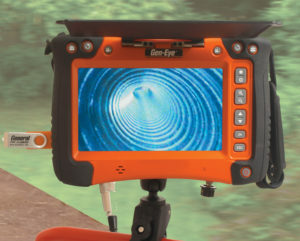 Includes GX-500 Command Module, SL-M-GL-200 reel with Mini Self-Leveling Color Camera, Docking Kit and 2 & 3″ skids.